Cheston Grange, 3 Little Cheston Barns near Wrangaton is a beautifully presented and deceptively spacious barn conversion situated in a small development of just four units offering a wealth of charm and many character features. The property was converted some 15 years ago and provides en-suite facilities to three bedrooms, a spacious living room with exposed beams and countryside views. Glazed panels lead through to the kitchen/diner with integrated appliances whilst a mezzanine overlooks the living area and could accommodate a study area or occasional bedroom. The well maintained and level rear garden offers a patio area, gravel and lawn with gated rear access. A double garage providing off road parking for two vehicles completes the accommodation. 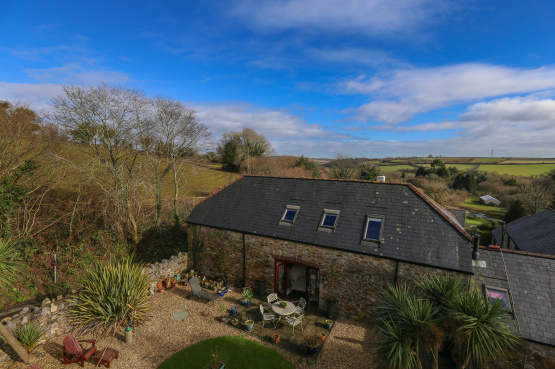 Located on the edge of the South Hams district, the property benefits from exceptional scenery. Dartmoor National Park is within a short drive with a local riding school, golf course and the village of South Brent offering a strong and thriving community with shops, post office, three churches and a local primary school. South Brent is situated off the A38 dual carriageway with easy access to both Plymouth and Exeter. Cheston Grange is offered for sale with a price of £415,000. For further information please contact Marchand Petit Estate Agents Totnes on 01803 847979.